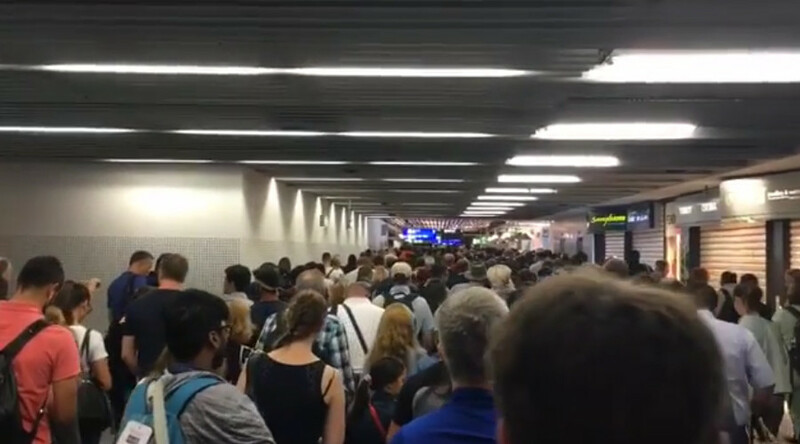 Police have evacuated several terminals at Frankfurt International Airport after a suspicious passenger bypassed air security check, the airport said. Earlier reports in German media said a bomb threat had prompted the evacuation. “A passenger bypassed air security check in the aviation security-controlled area,” Frankfurt Airport tweeted. The airport tweeted that it has closed A and A+ terminals. “The federal police therefore cleared Piers A and A+ and passengers will undergo the security check again,” the airport operator told Reuters. The spokeswoman added that the breach would lead to flight delays. Police later told Reuters that it is still unclear whether or not the person who prompted the evacuation was intentionally bypassing the security checks. It has yet to be established if the passenger was carrying any forbidden items. “The main aim of the evacuation is to ensure that the terminal is secure,” the spokesman for Fraport said. The airport management have tweeted that operations will resume at 12:30pm local time (10:30 GMT). Police are currently questioning the person who prompted the evacuation, a spokeswoman told Reuters. Frankfurt Airport, the fourth-busiest in Europe, is operated by Fraport and serves as the main hub for Lufthansa. It covers an area of 2,000 hectares and has a capacity of some 65 million passengers per year.